Здесь вы можете прочитать биографию Петра I на английском языке. 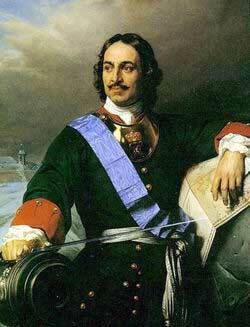 Peter I (30.05.1672 - 08.02.1725) - Russian Tsar. Peter I was born on 30 May 1672. When Peter was a child several teachers were delegated to teach him. Among Peter’s tutors were Patrick Gordon, Nikita Zotov and Paul Menesius. This process was commissioned by Tsar Alexis I. In 1676 Tsar Alexis I died. As a result the power was left to Feodor III who was Peter’s elder half-brother. He died in 1682 and there were not his descendants. Consequently there was a conflict for power between the Miloslavsky and Naryshkin families. Other half-brother of Peter, Ivan V, was heir to the throne but his health declined. As a result at the age of ten Peter became Tsar chosen by the Boyar Duma. Peter was interested in shipping and shipbuilding. He was a tall man and his height was about 200 cm. He did not have square shoulders and his feet and hands were small. Moreover Peter’s head was small for his figure. In accordance with his mother’s desire Peter married. The marriage was in 1689 and Eudoxia Lopukhina became his wife. 10 years later the marriage broke down and Peter’s wife became a nun. In 1689 the power was in the hands of Peter’s half-sister Sophia. Because of two ineffective Crimean campaigns her authority was undermined and Peter planned to take power. Peter could become an independent ruler only in 1694 when his mother died. Officially there were two rulers: Peter and Ivan V. In 1696 Peter became the absolute ruler when Ivan V died. On 19 August 1700 Peter declared war on Sweden. The main aim of the war was to acquire control of the Baltic Sea. At that time it was under Swedish Empire control. Denmark-Norway, Saxony and the Polish-Lithuanian Commonwealth supported Peter. In 1721 the Treaty of Nystad ended and the Russian Empire acquired control of the Baltic Sea. This war went down in history as Great Northern War. In October 1721 Peter was proclaimed Emperor of All Russia. Augustus II of Poland, Frederick William I of Prussia, and Frederick I of Sweden recognized this title. Other monarchs did not agree with it. Some rulers were afraid that Peter would claim authority over them. Peter imposed new taxes in the Russian Empire. The household tax and the land tax were abrogated. These two taxes were superseded with a poll tax. He also reformed the Russian Orthodox Church. In 1724 Peter married for a second time to Catherine who was crowned as Empress. However he remained actual ruler of Russia. Peter had 2 wives and 14 children by them. Only 3 of his children survived to adulthood. In 1723 Peter’s health declined. He had problems with bladder and urinary tract but he was cured. As legend has it in November 1724 while at Lakhta Peter was forced to rescue the soldiers drowning not far from shore. Consequently his health became worse and these problems caused his death. Peter died on 8 February 1725.